The Cowal Way is a 57-mile walking route that runs practically the whole length of the Cowal Peninsula (and a little beyond). That’s quite a long walk: you may wish to select one or two stretches that you want to walk for a day or two, or you may have time and energy to do the whole thing. The Cowal Way has sections of varying difficulty, and goes through some lovely countryside. It begins at Portavadie (the place where the ferry arrives in Cowal from Tarbert on Kintyre), and runs north and north-east to the shore of Loch Lomond. This means that you can walk the Cowal Way as part of a longer walking holiday. You can for example walk the Kintyre Way from the south end of Kintyre as far north as Tarbert, take the ferry to Portavadie and then continue north through Cowal. An alternative plan coming from the south is to walk the West Island Way along the Isle of Bute, from sixth-century monastery of Kingarth in the south to Rhubodach in the north, take the ferry from there to Colintraive in Cowal, and then walk up the east shore of Loch Riddon to join the Cowal Way near Bealachandrain (NR996832) (bealach an draighinn ‘pass, passage of the blackthorn’). The Cowal Way ends in the north on the shore of Loch Lomond at Inveruglas, where there is a fully equipped visitor centre. From here you can take a bus home (north or south), or you can take the ferry across Loch Lomond to Inversnaid, and there you can join the West Highland Way – another popular long distance walk – and either go south along Loch Lomond shore to Rowardennan (rubha ard Adhomnáin ‘the high promontory of [Saint] Adomnán’), Balmaha (bealach Mo Cha, ‘the pass of [Saint] Kentigerna’) and Drymen (druimean ‘ridge’); or go north along the shore to Ardlui and beyond (a slightly harder walk). An excellent walker’s guide to the Cowal Way can be found on the website dedicated to this walk at http://cowalway.co.uk. But please remember (in spite of all the wonderful photographs on this website, which are almost all taken in bright sunshine, under clear skies, with water still and mirror-like) that the weather in Cowal is not always like that. It can change very suddenly. Always travel with stout footwear, waterproofs and warm clothing; also with the relevant copies of the Ordnance Survey Pathfinder maps (the 1:25,000 series, sheets 362, 363 and 364 cover the Cowal Way).. If you have difficulty at some point on the walk, bear in mind that for much of its length you are within a short distance of a bus-stop! And you can sometimes call a taxi – though please remember that your mobile phone might not always get a signal on the Cowal Way. Much of the Cowal Way can also be done by bike on small quiet roads and tracks. And where that is not possible, there are often parallel roads or tracks which you can cycle on. Check your OS maps. You will also find very useful guidance in an affordable little guidebook called The Cowal Way by Michael Kaufmann and Jim McLuckie. You can buy it here: http://www.rucsacs.com/books/Cowal-Way. You may also find the WalkHiglands website useful. As there is such good guidance to be had on-line and in Kaufmann and McLuckie there is little point in repeating all that here. However, we will mention some of the things along the route that might be of interest to the modern pilgrim, whether he or she wants to walk the whole route, or only some selected parts of it. 1] Portavadie (Gaelic port a’mhadaidh, ‘port of the dog’) has a new marina development, with food and drink, accommodation and useful shops. Build up your strength for the walk with a good meal and a couple of pints. And make sure you have all the waterproofs, maps etc. that you want. 2] Kames (Gaelic camas ‘bay’) is a village on the Kyles of Bute, overlooking that island. The very ancient chapel of Kilmichael (‘St Michael’s Chapel’) is less than a mile to the east of you here (NR993705), and if you can find someone with a boat to carry you across the Kyles, it is worth a visit. 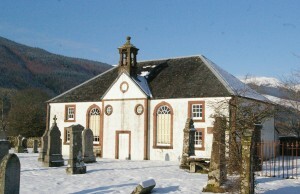 Also at Kames is a Church of Scotland parish kirk. 4] Continuing up the loch-side you will pass Ormidale. 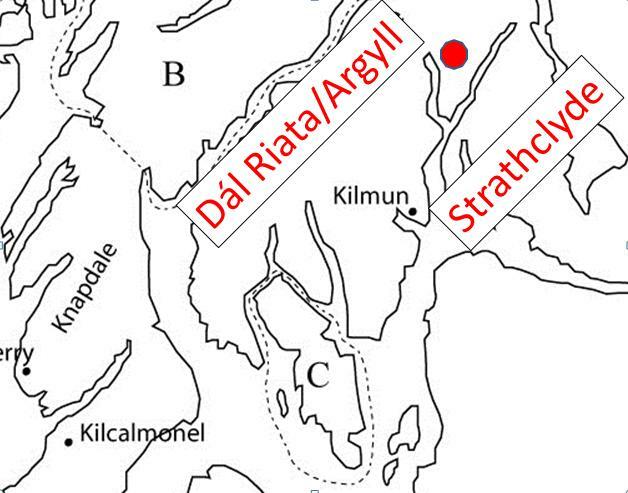 The second element is Old Norse dalr, so this is one of a handful of Cowal place-names that bear witness to Scandinavian settlement in the wake of the Viking invasions of the ninth century. It means ‘Ormr’s valley’. 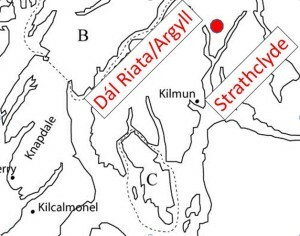 In these outer waters of the Clyde – Cowal, Bute, Kintyre – there was early Norse occupation, but rapid assimilation of the occupiers to the local Gaelic society and language. They very quickly started naming their landscape in Gaelic. This is quite unlike Scottish island areas further north, like Islay, Lewis and Harris, where there are great numbers of Norse names because the Scandinavians destroyed local Gaelic society far more thorougly. i] As well as having a hotel where you can stay or eat and drink, Colintraive has lots to see. The Heritage Centre tells the story of the village in photographs and film. The church is generally open, and you can pop in as you pass by. A community garden is also worth a visit, with its plants, paths, pond and viewing platform. And the Caol Ruadh Scottish Sculpture Park – as its name suggests – promotes and sells Scottish sculpture. ii] Going north from Colintraive, start on the A886, but take a left after about 1.5km, to stay on the smaller and quieter shore road. After 1km on that road, you may want to hike 400m up the hill to visit the early chapel site on Fearnoch farm. After this little detour, return to the little road and follow it north along the shore. After 3km you will return to the A886, which you follow until you meet the Cowal Way near Bealachandrain (NR996832). 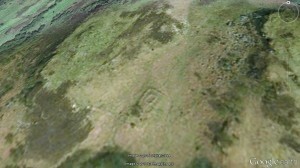 5] About 1km past Bealachandrain you will find yourself in the Clachan of Glendaruel. 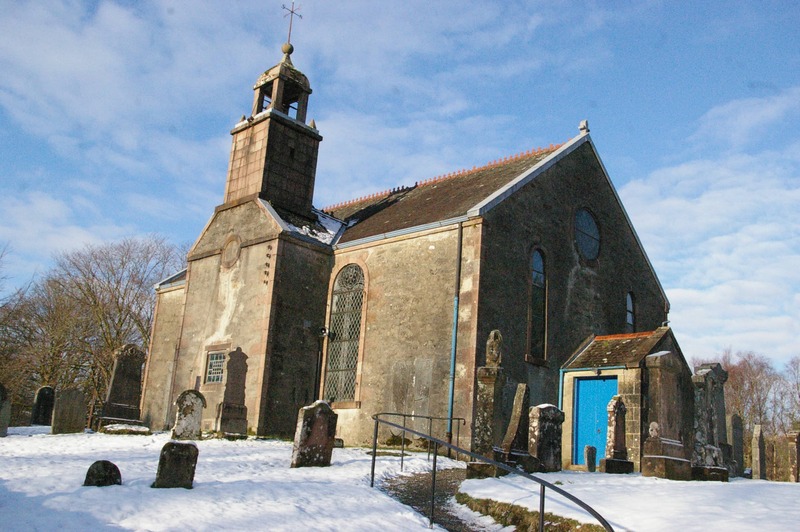 Gaelic clachan means (among other things) the main village of a parish, built around the kirk, just like this one. Here you will find the church of Kilmodan (‘church of St Modan‘) – a handsome building built on the site of a medieval church. It is kept open during the day, and you are welcome to pop in. Kilmodan Church – a modern building on an ancient site. Testimony to its medieval past is its fine collection of later medieval carved stones, now kept in a small shelter in the graveyard where they are safe from the elements, but the shelter is left open to visitors. 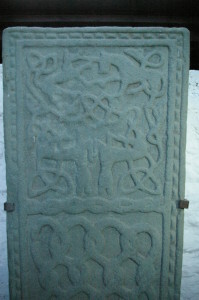 Interlaced animals enliven a medieval grave-slab at Kilmodan. At the top a unicorn defends itself against a (?) wolf. The lost St Modan’s Well is somewhere nearby, vanished in the commercial forestry. It may be that it will be found soon, as members of the local community are looking for it, and their local organisation, the Colintraive and Glendaruel Development Trust, now owns the land that is on. There is a hotel in the clachan, too – closed at the moment, but the Development Trust hopes it will re-open when they are able to exercise their legal Right to Buy. At nearby Glendaruel Caravan Park you can rent a caravan or pitch your tent, or even hire a pre-erected tent for the night. 6] Continuing up the glen on the track which runs west of the river, enjoy a splendid walk. If you look up to the left you might see Cailleach a’ Bheathrach, ‘the old lady of the thunderbolt’ – not an old lady at all, actually, but a rock near the top of the ridge (NS001901). According to the minister of the parish in the mid-nineteenth century, ‘Marvellous properties were ascribed by the superstitious inhabitants to this thundering lady; it was said that she could, with ease and incredible agility, transfer herself from one hill to another, command terrific thunder and desolating deluges at her pleasure; and hence the dreadful apprehensions of incurring her ire that generally prevailed.’ (New Statistical Account, 165). 7] There was once a chapel dedicated to St Brigit up this glen. It gave its name, Kilbride, to a farm which was later subdivided into two parts, Kilbridemore (”big Kilbride’) which is the farm on your left at NS030908, and Kilbridebeg (‘little Kilbride’) which no longer exists. Nothing remains of the chapel except for the name now attached to the farm. 8] After a few miles high in the hills of Glen Branter, the Way drops down into the valley of the River Cur and pushes north to Clachan of Strachur (Gaelic srath ‘broad river valley’ of the Cur). Here is the parish church of Kilmaglash, apparently on the site of an early medieval church, with its many medieval carved stones embedded in its outer walls. A 2km detour to the north of the clachan will take you to Creggans Inn, where you can eat and drink, or even stay a night or two. Also worth visiting in Strachur is the Smiddy Museum. 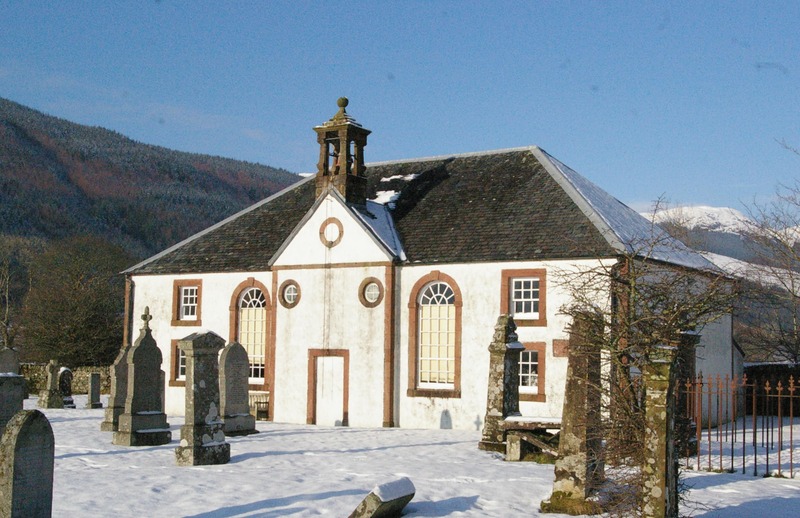 9] The next pilgrim attraction on the route is Lochgoilhead, whose medieval church was dedicated to The Three Holy Brethren – whoever they were. We know nothing of these saints except that there were three of them. And maybe they were really brothers. 10] Moving east and back into the hills above Lochgoilhead, watch out for Clach a’Bhreatunnaich ‘rock of the Briton’ about 1 km to the north (NN217025). You might even think it worth crossing to the other side of the glen, across the Donich Water, to pay a visit (though it’s a bit of a struggle getting through the forestry). 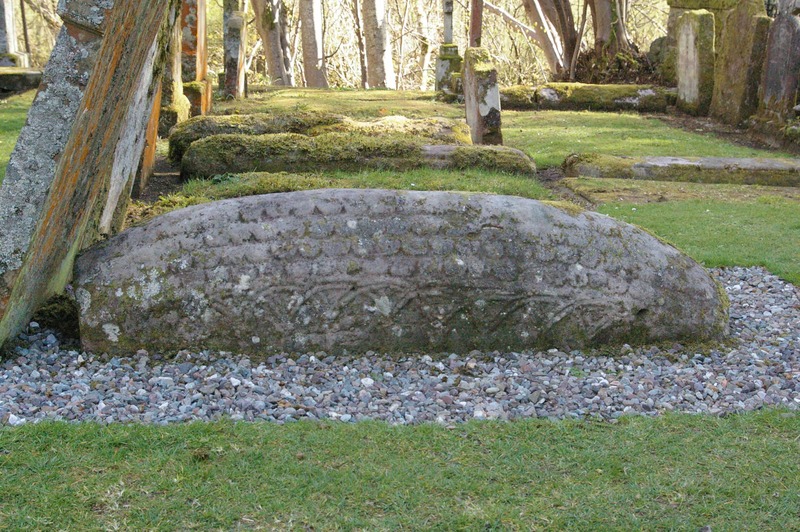 This very large and conspicuous boulder may once have been a boundary-marker between the Gaels of Cowal and the rest of Argyll to the west and the Britons of the kingdom of Strathclyde to the east and south. 11] Inveruglas (the inbhir ‘estuary’ or ‘outflow’ of the Dubhghlais ‘black stream’) marks the end of the Cowal Way. It is interesting that there is another stream of exactly the same name only 11km to the south, though the name here has been Anglicised – it is shown on maps as Douglas Water. Its outflow into Loch Lomond is at Inverbeg (inbhir beag, ‘little outflow’) It’s an illustration of how place-names often have very local application: presumably no one was confused by the fact that two rivers 11km apart were both called Dubhghlais, because the frame of reference was intensely local. There would no doubt have been a way of distinguishing them, if that was necessary, in a more wide-ranging conversation. But generally people would have known which one they were talking about – this one, here! At Inveruglas you’ll find a welcoming visitor centre and cafe. Just offshore is an island with the remains of Inveruglas Castle, the stronghold of Clan Macfarlane, destroyed about 1654 by soldiers loyal to Oliver Cromwell. You can get a bus from Inveruglas – to local destinations or further afield. If you have a little time to spare before returning home, you might like to visit Luss, further down this side of Loch Lomond. You are in a different territory now – not Argyll, but the medieval earldom of Lennox. At Luss it is St Kessog who is remembered as the apostle to the whole area, and dedications to this saint are scattered across the earldom – at Luss and at Buchanan just across the water; also south of Loch Lomond at Kilmaronock, Strathblane and New Kilpatrick, and further east at Auchterarder, Callander and Muthill – all in a fairly defined territory. 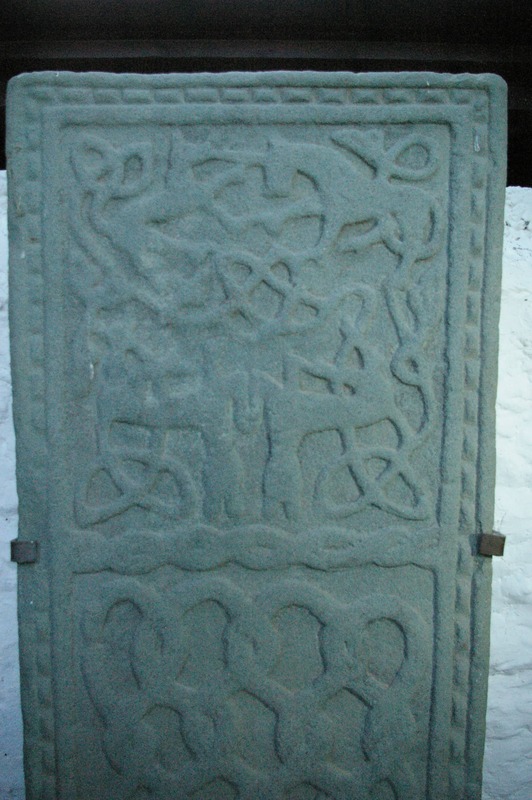 At Luss you will find a medieval hogback stone in the graveyard of a delightful lochside village church, and a pair of cross-slabs of perhaps the seventh century, or a little later. Later medieval carvings alkso survive in the church. 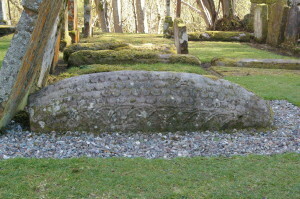 A ‘hogback’ stone at Luss kirkyard indicates the northward reach of a British-Norse hybrid culture in the Strathclyde kingdom in about the eleventh century. Inveruglas, at the end of the Cowal Way, is also the place to catch the ferry to Inversnaid, where you can pick up the West Highland Way and continue to enjoy some of Scotland’s finest countryside. Just offshore is an island with the remains of Inveruglas Castle, the stronghold of Clan Macfarlane, destroyed about 1654 by soldiers loyal to Oliver Cromwell.